One of the hardest things to fully wrap our minds around is this basic principle of grace. Sure, I love the idea of my slate being cleaned, but I might hate—absolutely hate—that grace robs me of the privilege to “boast” (cf. Ephesians 2:9) of my moral superiority. Don’t I deserve credit, after all? The problem of this kind of arrogance is that it leads us into a dangerous path, relationally speaking. Because only one of two things can happen. First, my moral system might actually work for me, more or less. I may spend a lifetime devoted to strict moral obedience. Life goes well—I get a good job, raise good kids, and be respected as a pillar of my community. I conclude that I am blessed; my righteousness has earned God’s approval. And I am constantly sneering at my neighbors, who have not achieved my blessing—clearly because they’re just not as morally upright as I am. Secondly, my moral system might not work for me. I might spend a lifetime of trying, only to be routinely confronted by the naked brutality of this fallen world. I obeyed all the rules; why doesn’t God bless me? I become bitter—at myself, at God, at my fellow church-goers who—despite not sharing my strict moral convictions—always seem way happier than I can ever hope to be. Life is far more messy than all that. But so is spirituality, so is grace. Jesus joins us in our mess and—as we’ve been saying—absorbs the stains of our sin that we might have God’s approval not through any—any!—works of our own, but only through the finished work that he achieved on our behalf. This is why it’s hard to hear the gospel if you’re a religious person. Because it’s easy to assume that you already know it—when all along you’ve only been learning to cling more tightly to your moral code. And it’s killing you. “The cross is the key signature of our theology.” This was the conclusion of one German author, for whom the cross loomed large in his understanding of God’s great story of redemption. He may as well have been quoting from Martin Luther, who years ago famously said that “the cross alone is our theology.” To be a Christian is to be a “soldier of the cross,” to borrow language from the old hymn. Yet when Mel Gibson’s film The Passion of the Christ was released, many reviewers were baffled that Gibson would ignore every scrap of Jesus’ ethical teaching in favor of delivering a brutal portrayal of Jesus’ crucifixion. At least one reviewer sneeringly dismissed the film as the “Jesus Chainsaw Massacre,” revolted that a religious film would disproportionately focus on a man’s blood rather than his message. But don’t you see? For Christianity, Jesus’ blood is the message: the message of love, of justice, of forgiveness all rolled into a singular, defining event. The cross was no great accident or interruption in God’s plan of redemption. It was the plan all along. Medical experts tell us that the most likely cause of death was slow, painful asphyxiation—that the lungs could not adequately expand and contract when suspended on the cross. But this might have been one of several causes of death, including death from blood loss, shock, or even being attacked by wild animals. In the ancient world, when someone was crucified, the public places were chosen so that people would stop and look. And so today, when we speak of the Savior crucified, we must stop and look. We must see the blood. We must see the nails. We must cringe at the (literally) God-forsaken spectacle we see before us, we must see the Savior pushed to the bitter edges of the world that we might be invited to taste in Heaven’s sweetness. And above all, we must see that here is our shame, lying not on our own shoulders, but on his. On Christ’s. On our behalf. Here is the sacrifice that lifts away the sin of the world (cf. John 1:29). My shame died there with him. He was broken that I might be made whole again. “The deformity of Christ forms you,” wrote Augustine. “By his wounds,” God said through Isaiah, “we are healed” (Isaiah 53:5). I believe that your Son Jesus died in my place. I ask for your forgiveness. It’s as simple as that. That’s grace. That’s your first small step toward a larger world. If you have said that prayer—either now or as a result of our recent sermon series, we’d love to hear from you. You may find our contact information through the Church’s website (www.tristatefellowship.org), or you can contact me personally at my email address (chris@tristatefellowship.org). Cicero, Contra Verres in The Verrine Orations, 2.5.64. I need you to imagine something. Let’s imagine that you need to go in for surgery. We’ll imagine that it’s an appendectomy—a fairly standard procedure, but in the absence of treatment can become something much more dangerous. If you’ve ever had surgery, you know there’s a whole pre-flight checklist that everyone goes through. It’s more than just dotting “i’s” and crossing “t’s.” It’s a whole protocol that ensures the absolute safety and integrity of each participant from patient to surgeon. The final step is to wheel you into the operating room where you are put under for the procedure. Now imagine, right as your eyes are about to shut from the anesthesia, that you look over to see the surgeon walk in the room. Instead of wearing the sterile scrubs, mask, and gloves you expect, your surgeon is covered in mud, or wearing those ugly rubber orange gloves she found in the janitor’s closet. If you caught such a vision, your last thoughts before shutting your eyes would be paralyzing fear. This was the one person you were counting on for what would ultimately be a life-saving procedure. Yet your health had now been compromised by her lack of purity. at in the Hebrew, we would notice that it doesn’t just say “Satan,” but “the satan,” which might simply mean “the accuser.” Again, this is a vision, not reality, so we wouldn’t be surprised to see such supernatural elements here, but it’s not necessarily clear that Zechariah is referring to the devil himself or merely an enemy of Israel hurling accusations. What we are meant to see is the defilement of Joshua, the high priest. Customarily, priests like Joshua were sequestered for a week to prevent them from coming into contact with anything unclean so that they could perform the ceremony undefiled. There was even a set of ritual bathings, after which Joshua would emerge wearing pure white robes. But in Zechariah 3:3, Joshua is wearing “filthy robes.” The original Hebrew seems to suggest that he is actually covered in excrement. He is expected to be clean, to bring purity to the nation. But in God’s eyes, all the rituals and duties do not truly cleanse the stain. For since the law has but a shadow of the good things to come instead of the true form of these realities, it can never, by the same sacrifices that are continually offered every year, make perfect those who draw near. 2 Otherwise, would they not have ceased to be offered, since the worshipers, having once been cleansed, would no longer have any consciousness of sins? 3 But in these sacrifices there is a reminder of sins every year. 4 For it is impossible for the blood of bulls and goats to take away sins. There’s no doubt about it: sacrifices ultimately meant nothing. Not to keep using such visceral imagery, but we need to truly wrap our minds around the culture of sacrifice in the ancient world. To do this, we can actually look at the history books from the ancient people and catch a glimpse of what their religious system looked like. The Kidron would have looked like the Chicago river on St. Patrick’s Day—only instead of green it would have gradually become a deep red. In short: the system was bloody. So when Jesus made a once-for-all sacrifice, it would have stood in sharp contrast to this older style of worship. Imagine living in a city where once a year, the local river turned red from all the killing. Where the sounds of thousands upon thousands of animals being slaughtered could be heard above the traffic. Inadequate, the Bible says. Only a shadow of what’s to come. See, we need a better high priest—a true and better Joshua. We find this in Jesus. He’s the true and better high priest who offers a true and better sacrifice, so that his once-for-all sacrifice could atone for the sins of God’s people, past, present, and future. 150 years ago today on April 9 of 1865, the Generals of two massive armies – such as had practically never before been assembled – met in the parlor of a house in Appomattox, Virginia to come to an agreement ending the American Civil War. It was the culmination of a great struggle of ideas and values. Holding onto one set of ideals was an awkward country lawyer who had, through circuitous circumstances, became President in the most controversial of times. Because of plots against his life even before assuming office, Abraham Lincoln essentially had to sneak into Washington by train under cover of darkness to take his place in the great struggle of leading a fractured nation. His life was constantly in danger. Yet he held onto those ideals that he knew to be correct. He was hated and embattled by varied factions at every turn, continuously holding together the most fragile alliances and walking the frailest of political ropes to accomplish truth and justice. If you are going to give your life to something, particularly when investing in identification with a person or cause that may be despised by the masses of the people, you want to know that it is the substance of truth and enduring value. He tells them that there is reason to endure. Earlier, they had come to trust in Christ. They knew in those early days of faith that it made all the difference in their lives; and though persecuted and ridiculed, they endured – standing in identification with others of the same – even those imprisoned … even when losing homes and possessions. They had an appropriately accurate view that their earthly possessions were of no comparative value whatsoever to what was to be eternally their inheritance. But the ridicule, losses and abuse just kept going on and going on. And now some were debating going back to the old ways to just fit better into the surrounding world and thereby make life easier. And the writer has given them now almost 10 full chapters of reasons as to why their faith in Christ was superior to the old stuff, the old ways, the earthly ways, the temporary world of mere things. He encourages them to run toward what is perfect and eternal! Run away from death; run to life! The reason to hang on is because the hope of the inheritance of life eternal is better than the current merely temporary possession of the visible comforts of this world. Hebrews 10:39 But we do not belong to those who shrink back and are destroyed, but to those who have faith and are saved. The writer expresses here, as he does in several other places, that those reading this are going to respond positively to his message. They were going to persevere through the trials, or, as in the title of our study, they were going to ENDURE. We have been fortunate in our time and in our country to live in unusual periods of ease for people of faith in Christ. However, there is evidence all around us that this comfort is crumbling. Where might it lead? We do not know. But what we do know is that, no matter how bad it gets, we have a hope that is eternal and is worth it all to endure in faith and trust. Today’s passage is simply frightening; there is no way to soften it. It is sort of the spiritual equivalent of being told by the doctor that there is nothing else that can be done to save a person’s life. This is the end of the road. This section is one of several warning passages in Hebrews, and they are difficult to teach and explain easily and clearly. But as always with this letter, remember the situation of the readers – people being warned not to throw off the Christian faith to return to an easier life of convenience. The previous passage ended with a thought about the approaching day of the Lord and the end of time. Peace and stability in this life is great, but to trade off the truth for such would be to make a pretty stupid deal. And beyond ignorant, it put a person in a place of terrible judgment as an enemy of God. There were no sacrifices for such an apostasy. The Old Testament Scripture being referenced was one that talked about the judgment that fell upon someone who embraced idolatry. How much more severe judgment would surely therefore befall someone who walked away, not merely from the shadow of things in the OT system, but actually from the fulfilled reality of redemption in the person and work of Jesus Christ. If you reject the final payment, there is no other payment in the pipeline. These verses also picture more than a merely mild decision. The “trampling” verb used in this verse is one that means to stomp all over and trample completely under foot. This level of apostasy would only be done by one who never really had received and fully trusted in the truth of Christ to begin with. 26 If we deliberately keep on sinning after we have received the knowledge of the truth, no sacrifice for sins is left, 27 but only a fearful expectation of judgment and of raging fire that will consume the enemies of God. 28 Anyone who rejected the law of Moses died without mercy on the testimony of two or three witnesses. 29 How much more severely do you think someone deserves to be punished who has trampled the Son of God underfoot, who has treated as an unholy thing the blood of the covenant that sanctified them, and who has insulted the Spirit of grace? 30 For we know him who said, “It is mine to avenge; I will repay,” and again, “The Lord will judge his people.” 31 It is a dreadful thing to fall into the hands of the living God. So how do we apply such a passage as this to our lives? Our current circumstances don’t quite match up in a one-to-one way with these original readers. However, a day may come when it is more like what they faced. It is a common theme of discussion in our country right now about the increasing pressure upon Christians and societal disdain for our values. The future may be more difficult for living for Christ in an open way. At the very end of Paul’s writings, at a time when his own martyrdom was fast approaching … of being “poured out,” he said, “everyone who wants to live a godly life in Christ Jesus will be persecuted.” The abnormal thing is to not be persecuted. The Christian life can be very difficult in a hostile and secular culture, but there is no other place to go. Probably more than a couple of you reading this have no memory of a silly but popular TV game show in the 60s and 70s called “Let’s Make a Deal.” People from the audience became “traders” and were given a prize for being selected that was of some moderate value – like a television. They were then offered the opportunity to either take the prize and be content with what they had, or to trade it for something unseen and unknown, often hidden behind one of three curtains. It could be something of truly great value, or something absolutely ridiculous and worthless. The Hebrews were essentially on the edge of – from the writer’s perspective – making a terrible deal. They were ready to keep the familiar old thing that they knew (the earthly, visible, Levitical system of sacrifices) rather than trading it for something of inestimable and eternal value (Christ and the New Covenant). But here was the deal for them: what was behind the curtain was not unknowable. The curtain was open to see what was there – literally, it was. The curtain spoken of in our passage today was that one that prevented access to the Most Holy Place in the temple – the one that only the high priest went behind on one day of each year. Recall though what had happened at the moment of Christ’s death. There was an earthquake that caused this huge, thick, heavy curtain to rip from top to the bottom. The result was that the most holy place was open for view. And of course this all symbolized that an entirely new day had arrived with a final sacrifice for sin. The old system was now obsolete. We can confidently draw near to God. What a wonderful truth this is. The creator God wants us who know him as our Lord and Savior to enter right into his royal presence without any fear of judgment. Amazing truth. We have a hope to hold onto in any and every circumstance. This is because of God’s faithfulness. There is nothing that happens outside of that. We should serve one another by being faithful to be together. When you don’t do this, you hurt both yourself and other people. We need each other. None of us have everything that we need to any extent that we can make it by ourselves. Is there an application out of this verse that missing church should be far more rare than common? Yep! God said it, not me! See you Sunday, if not before. There are very few of us alive in America now who can remember what it was like to live in an era without electrical or indoor plumbing utilities. Life was much harder without these conveniences, and gaining them was a great relief. I don’t remember such a time, but I grew up with parents who did. I do remember when I was in 3rd grade that we had a well drilled in our yard, just outside the dining room windows. I recall becoming buddies with the well-drilling guy – can still remember his name to this day! I thought it was really fascinating, and for a while, that is what I wanted to do in life! My father was so excited about this for another reason that I did not really understand at the time. He was looking toward to the relief of not having to deal with the work of a constant water supply concern. Prior to the well, the water in our country house was from a cistern. There were valves on all the downspouts from the house and garage that would direct rain water from those roofs either into the cistern or out onto the ground. I recall my dad going out into the rain to make sure they were either on or off, depending upon the need. He had to try to keep the supply in the tank full, yet if he was not watching carefully enough, an oversupply would cause it to overflow and flood the basement. But there was a worse time in his life. He grew up on a farm in the early 1900s … far from electrical supply, and long before plumbing. Water had to be carried from a springhouse at the bottom of the hillside. It was one of his chores as a boy. Light was provided by kerosene heaters; and heat came from a pot-bellied woodstove in the kitchen – which honestly only heated the kitchen. Snow would blow through the window frame cracks, and at 5:00 in the morning when he awoke to milk the cows, he might find small snow drifts on his bed sheets. So my dad never really got over the amazement of indoor plumbing and electricity. He was profoundly thankful and believed himself to be living in the ultimate modern age. The work of carrying water and lanterns was done. He could flip a switch or turn on a faucet, and everything he needed was right there. Our passage today talks about the ongoing work of the system of the old covenant – one where the Levitical priests had endless work. It was a career with job security. People sinned continuously, they needed their sins dealt with continuously, and so there was an endless parade of sacrifices and a literal river of blood … there really was! Ancient writers talked about what the Temple area was like on the occasions of the major feasts, such as Passover. Over a quarter-million sacrifices were made for over two million people. Holes and channels in the floor area of sacrifices carried the blood out to the Kidron stream – which flowed red like the river in Chicago flows green on St. Patrick’s Day. Imagine the sights and sounds of this! Consider the mess … the carcasses of the animals. The entire scene pictured what a terrible mess was the issue of sin, while also illustrating the price of covering it … but it wasn’t really covered! Not permanently. The repetitious nature of it illustrated that the Levitical system was insufficient and inferior. But, as the writer has indicated, there came an entirely new priest of a new order. This priest – Jesus Christ – was also at once the sacrifice as well. Entering one time into the true tabernacle – not the shadowy one of the Levitical system – with his own blood he made a once and for all, final, sacrificially-sufficient payment for all sin of all time. Man, that is awesome! We don’t have to do something like bring animals for some intermediary spiritual personage to sacrifice for our sins. Those sins have been paid for already. What we do regularly is memorialize and remember the one who paid that price for us. And that is what we do with communion. And oh what a relief it is to have the payment made once and for all. 10:1 The law is only a shadow of the good things that are coming—not the realities themselves. For this reason it can never, by the same sacrifices repeated endlessly year after year, make perfect those who draw near to worship. 2 Otherwise, would they not have stopped being offered? For the worshipers would have been cleansed once for all, and would no longer have felt guilty for their sins. 3 But those sacrifices are an annual reminder of sins. 4 It is impossible for the blood of bulls and goats to take away sins. Here we are just five days away from the most odious of all days on the calendar – April 15th. To be honest with myself and you, it is not just that it involves the payment that it does – though I support the Reaganesque concept of economic growth resultant from lower tax rates. The bigger problem is the actual annual headache it produces in terms of the piles of paperwork and meetings with accountants, etc. This is all greatly exasperated by family business ownership ventures along with unique tax categories for the clergy part of it – involving employee status for the IRS but self-employed status in terms of social security (I’m not making that up!). It is a mess to sort out! It would be so wonderful to have a situation where it was simply not necessary anymore. Imagine that! Think about what it would be like to not have to pay so much money toward a government that spends so much of it (along with our kids’ and grandkids’ future money) in ways that are far from necessary or honorable. Imagine never again having to gather financial information, tax forms, accountant appointments, etc. That would be fantastic! It is said that there are only two certainties in life: death and taxes. The annual experience of dealing with the latter makes you want to experience the former! In the Old Testament / Old Covenant system of worship, it must have been a similar sort of pain to have to deal with sin. After arguing with his wife about whether the sheep in the backyard were a flock or a herd (either is correct), the worshipper was always having to pick out the best young lamb for yet another sacrifice. In honest self-evaluation, it was unjust to be angry about the situation – after all, as a sinner there was no ground for any attitude other than humble contrition and gratitude that a method existed for paying the great debt of sin. It was an annual reminder that a final payment had not been made, and that the best that could be found was always only temporary and short of the perfect ideal. But in Christ, a new day has come. A new priest has come. This priest was like no other; he was of a different sort. He also brought a new sacrifice unlike any other. It was not some dumb bull or goat (like all the priests heretofore had done). He himself was the sacrifice, as well as the priest. The debt of the old system was paid and an entirely new system established. The new way had no necessity for annual or regular payments, all because there was no more debt to be paid. In fact, the debts have not only been paid, they have been erased and forgotten forever. So, aren’t you glad that this coming Sunday you don’t have to bring a goat, sheep, bull, turtledove or whatever and slit its throat and sprinkle blood all over the place and burn it on an altar? Yep! And … uh … you ARE going to be there at church, right? I mean, after all, isn’t that the least you could do in light of what we’ve been studying about these cross words? Now that I have gotten this far with these thoughts, and fearing that you might think I’m laying a guilt trip on you that is self-serving, I’m going to ask you to read just a bit farther in the chapter through verse 25. Here it is: 19 Therefore, brothers and sisters, since we have confidence to enter the Most Holy Place by the blood of Jesus, 20 by a new and living way opened for us through the curtain, that is, his body, 21 and since we have a great priest over the house of God, 22 let us draw near to God with a sincere heart and with the full assurance that faith brings, having our hearts sprinkled to cleanse us from a guilty conscience and having our bodies washed with pure water. 23 Let us hold unswervingly to the hope we profess, for he who promised is faithful. 24 And let us consider how we may spur one another on toward love and good deeds, 25 not giving up meeting together, as some are in the habit of doing, but encouraging one another—and all the more as you see the Day approaching. OK – YES, I’M YELLING NOW! AND I’M DOING IT FROM THE HIGH GROUND OF BIBLICAL TRUTH! AND I DO NOT FEEL BAD ABOUT IT AT ALL. THERE IS NO EXCUSE FOR NOT VALUING REGULAR ATTENDANCE WITH GOD’S PEOPLE. YOU NEED US; WE NEED YOU! DON’T GET INTO A HABIT OF NOT DOING IT! BE THERE! I’LL SEE YOU SUNDAY. 6 with burnt offerings and sin offerings you were not pleased. Vicarious – This is really another word for “substitution” … the idea of how Christ took our place. In theology it is often used with the word atonement. So, to say “vicarious substitutionary atonement” would be to almost pile up redundant modifiers. Assurance – The concept of the once-for-all final payment of Christ gives us assurance of salvation. 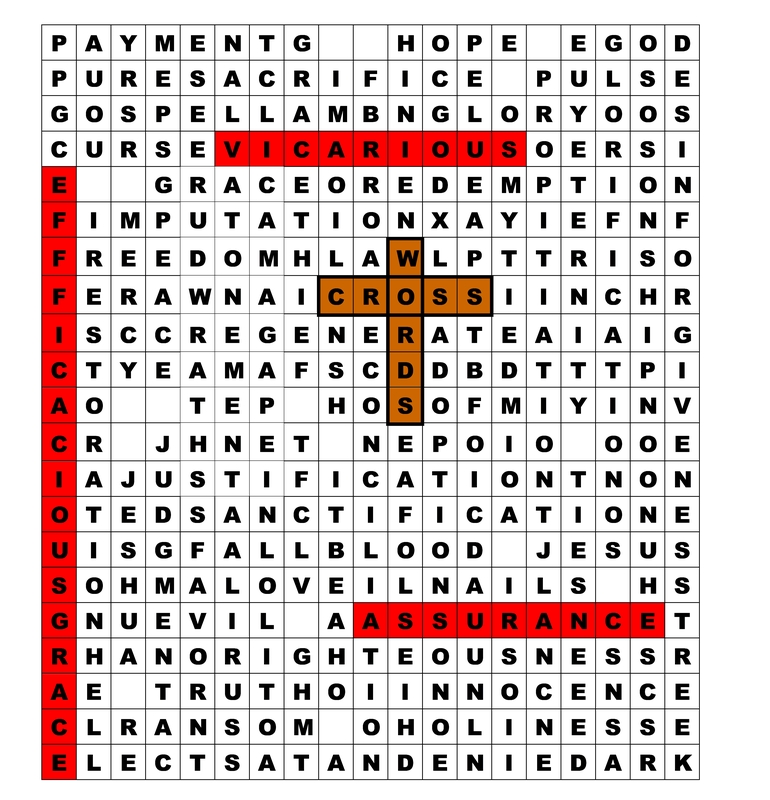 Efficacious Grace – This means that God’s grace has efficacy = sufficiency… that it works!